Over time, the people recognized the need for a strong hold to protect the king’s baliff, but serve as a residence at the same time. A core tower was built at Svartån (Black River) outlet with four levels, the top floor used for shooting. That tower still remains in the castle’s northeastern corner. Västerås became embroiled in bloody battles which prompted the castle’s strengthening and enlargement several times. It played an important role in the union struggles (conflict between Denmark and Sweden over remaining a ‘Union’ and which of them would be in control) during the 1400’s and early 1500’s and was the first kingdom level stronghold to fall to Engelbrecht during the conflict. It was taken by Archbishop Jöns Bengtsson in 1457 and besieged in 1464 by Kristian I without success. 58 years later, it was conquered by King Gustav Vasa after a year long siege. King Gustav Vasa used the castle as a royal residence and kept a parliament in the city. Both of these were significant in Swedish history. In 1527, Västerås parliament led to Protestantism and cut its ties with the Catholic church in Rome. Also, in 1544, Parliament made Sweden a hereditary kingdom. Prior to that parliament in 1540 – 1544, major renovations were made to the castle. A new king’s floor was built atop the old one in the east wing which also created the current main entrance. The west wing was also enhanced at the same time. Johan III continued with the new construction in the late 1570’s when a large Hall of State and chapel were decorated. When Karl X Gustav’s mother, Countess Katarina died in 1638, the castle’s status as a royal residence came to an end and it fell into disrepair. During war under King Karl it was used to house prisoners of war and was later converted into use as a standard criminal prison like many castles and fortresses. The most famous of those imprisoned here was Erik XIV who was brought here in 1573 and spent a year in the dungeon. The last prisoner to be housed in the castle left in 1857. In the late 1600’s (in spite of being used as a prison), renovations were made to the castle. The work was led by architect Mathias Spieler who was a close friend of Nicodemus Tessin. Fire ravaged the castle in 1736 and the furnishings from the Vasa era were destroyed. The fire spread to the majority of the wood and timber-framed buildings in the vicinity. 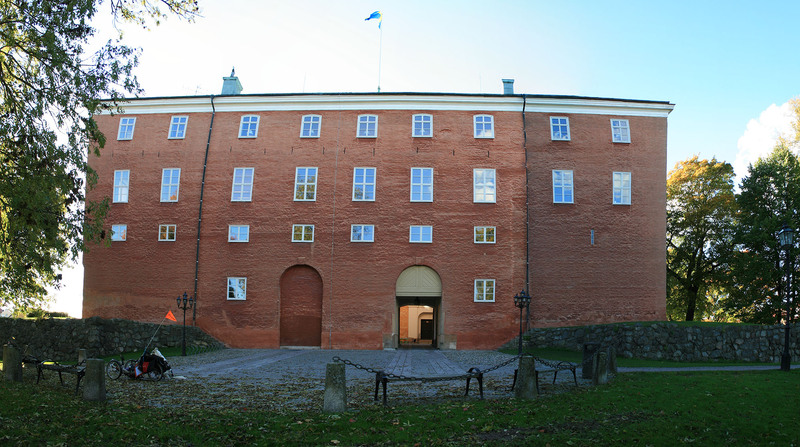 The castle was repaired and expanded in the mid 1740’s with architect Karl Hårleman and completed in 1750. Some internal changes were made during the 1800’s and during the 1920’s a restoration of the castle was undertaken by architect Erik Hahr. The focus was primarily on the state room and adjacent spaces as well as residences upstairs. A small portion of the castle has recently been modernized and converted into the governor’s residence.